Belfast ( /ˈbɛl.fɑːst/ or /ˈbɛl.fæst/; from Irish: Béal Feirste, meaning "mouth of the sandbanks") is the capital and largest city of Northern Ireland, and the centre of the tenth largest Primary Urban Area in the United Kingdom. On the River Lagan, it had a population of 286,000 at the 2011 census and 333,871 after the 2015 council reform. Belfast was granted city status in 1888. In all, over 1,600 people were killed in political violence in the city between 1969 and 2001. Sporadic violent events continue as of 2015, although not supported by the previous antagonists who had reached political agreement in 1998. Belfast City Council is the local council with responsibility for the city. The city's elected officials are the Lord Mayor of Belfast, Deputy Lord Mayor and High Sheriff who are elected from among 60 councillors. The first Lord Mayor of Belfast was Daniel Dixon, who was elected in 1892. The Lord Mayor for 2016-17 is Alderman Brian Kingston of the Democratic Unionist Party, while the Deputy Lord Mayor is Mary Ellen Campbell of Sinn Féin, both of whom were elected in June 2016 to serve a one-year term. The Lord Mayor's duties include presiding over meetings of the council, receiving distinguished visitors to the city, and representing and promoting the city on the national and international stage. The last elections to Belfast City Council were held on 22 May 2014, with the city's voters electing sixty councillors across ten district electoral areas. The results were: 19(+3) Sinn Féin, 13(-2) Democratic Unionist Party (DUP), 8(+2) Alliance Party, 7(-1) SDLP, 7(+4) Ulster Unionist Party (UUP), 3(+1) Progressive Unionist Party (PUP), with the Traditional Unionist Voice. Greens and People Before Profit Alliance all winning their first seats. For more details on Parliament of the United Kingdom, see Northern Ireland Assembly. As Northern Ireland's capital city, Belfast is host to the Northern Ireland Assembly at Stormont, the site of the devolved legislature for Northern Ireland. Belfast is divided into four Northern Ireland Assembly and UK parliamentary constituencies: North Belfast, West Belfast, South Belfast and East Belfast. All four extend beyond the city boundaries to include parts of Castlereagh, Lisburn and Newtownabbey districts. In the Northern Ireland Assembly Elections in 2016, Belfast elected 24 Members of the Legislative Assembly (MLAs), 6 from each constituency. Belfast elected 8 DUP, 7 Sinn Féin, 3 SDLP, 3 Alliance Party, 1 UUP, 1 Green and 1 PBPA MLAs. In the 2015 UK general election, Belfast elected one MP from each constituency to the House of Commons at Westminster, London. This comprised 2 DUP, 1 SDLP, and 1 Sinn Féin. The coat of arms of the city were designed by John Vinycomb and are blazoned as Party per fesse argent and azure, in chief a pile vair and on a canton gules a bell argent, in base a ship with sails set argent on waves of the sea proper. This heraldic language describes a shield that is divided in two horizontally (party per fesse). The top (chief) of the shield is silver (argent), and has a point-down triangle (a pile) with a repeating blue-and-white pattern that represents fur (vair). There is also a red square in the top corner (a canton gules) on which there is a silver bell. 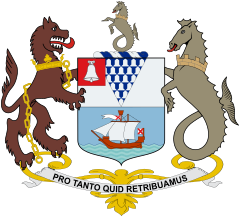 It is likely that the bell is an example here of "canting" (or punning) heraldry, representing the first syllable of Belfast. In the lower part of the shield (in base) there is a silver sailing ship shown sailing on waves coloured in the actual colours of the sea (proper). The supporter on the "dexter" side (the right hand side, to note that in heraldry "right and "left" are from the wearer of the shield's perspective) is a chained wolf, while on the "sinister" (the left side from the bearer's perspective) is a sea-horse. The crest above the shield is also a sea-horse. These arms date back to 1613, when James VI and I granted Belfast town status. The seal was used by Belfast merchants throughout the 17th century on their signs and trade-coins. A large stained glass window in the City Hall displays the arms, where an explanation suggests that the seahorse and the ship refer to Belfast's significant maritime history. The wolf may be a tribute to the city's founder, Sir Arthur Chichester, and refer to his own coat of arms. Belfast is at the western end of Belfast Lough and at the mouth of the River Lagan giving it the ideal location for the shipbuilding industry that once made it famous. When the Titanic was built in Belfast in 1911–1912, Harland and Wolff had the largest shipyard in the world. Belfast is situated on Northern Ireland's eastern coast at 54°35′49″N 05°55′45″W﻿ / ﻿54.59694, -5.92917. A consequence of this northern latitude is that it both endures short winter days and enjoys long summer evenings. During the winter solstice, the shortest day of the year, local sunset is before 16:00 while sunrise is around 08:45. This is balanced by the summer solstice in June, when the sun sets after 22:00 and rises before 05:00. As with the rest of Ireland, Belfast has a temperate or oceanic climate, with a narrow range of temperatures and rainfall throughout the year. The climate of Belfast is significantly milder than some other locations in the world at a similar latitude, due to the warming influence of the Gulf Stream. There are currently 5 weather observing stations in the Belfast area: Helens Bay, Stormont, Newforge, Castlereagh, and Ravenhill Road. Slightly further afield is Aldergrove Airport. The highest temperature recorded at any official weather station in the Belfast area was 30.8 °C (87 °F) at Shaws Bridge on 12 July 1983. Belfast holds the record for Northern Ireland's warmest night time minimum, 19.6 °C (67.3 °F) at Whitehouse on 14 August 2001. The city gets significant precipitation (greater than 1mm) on 157 days in an average year with an average annual rainfall of 846 millimetres (33.3 in), less than areas of northern England or most of Scotland, but higher than Dublin or the south-east coast of Ireland. As an urban and coastal area, Belfast typically gets snow on fewer than 10 days per year. The absolute maximum temperature at the weather station at Stormont is 29.7 °C (85 °F), set during July 1983. In an average year the warmest day will rise to a temperature of 24.4 °C (75.9 °F) with a day of 25.1 °C (77.2 °F) or above occurring roughly once every two in three years. The absolute minimum temperature at Stormont is −9.9 °C (14 °F), during January 1982, although in an average year the coldest night will fall no lower than −4.5 °C (24 °F) with air frost being recorded on just 26 nights. The lowest temperature to occur in recent years was −8.8 °C (16 °F) on 22 December 2010. The nearest weather station for which sunshine data and longer term observations are available is Belfast International Airport (Aldergrove). Temperature extremes here have slightly more variability due to the more inland location. The average warmest day at Aldergrove for example will reach a temperature of 25.4 °C (77.7 °F), (Template:Convert/LoffAoffDsqbrSoffT higher than Stormont) and 2.1 days should attain a temperature of 25.1 °C (77.2 °F) or above in total. Conversely the coldest night of the year averages −6.6 °C (20.1 °F) (or Template:Convert/LoffAoffDsqbrSoffT lower than Stormont) and 39 nights should register an air frost. Some 13 more frosty nights than Stormont. The minimum temperature at Aldergrove was −14.2 °C (6 °F), during December 2010. For more details on this topic, see Transport in Belfast#City layout. With an average of 670,000 visitors per year between 2007 and 2011, one of the most popular parks is Botanic Gardens in the Queen's Quarter. Built in the 1830s and designed by Sir Charles Lanyon, Botanic Gardens Palm House is one of the earliest examples of a curvilinear and cast iron glasshouse. Other attractions in the park include the Tropical Ravine, a humid jungle glen built in 1889, rose gardens and public events ranging from live opera broadcasts to pop concerts. U2 played here in 1997. Sir Thomas and Lady Dixon Park, to the south of the city centre, attracts thousands of visitors each year to its International Rose Garden. Rose Week in July each year features over 20,000 blooms. It has an area of 128 acres (0.518 km2) of meadows, woodland and gardens and features a Diana, Princess of Wales Memorial Garden, a Japanese garden, a walled garden, and the Golden Crown Fountain commissioned in 2002 as part of the Queen's Golden Jubilee celebrations. Despite a period of relative peace, most areas and districts of Belfast still reflect the divided nature of Northern Ireland as a whole. Many areas are still highly segregated along ethnic, political and religious lines, especially in working-class neighbourhoods. These zones – Catholic/Republican on one side and Protestant/Loyalist on the other – are invariably marked by flags, graffiti and murals. Segregation has been present throughout the history of Belfast, but has been maintained and increased by each outbreak of violence in the city. This escalation in segregation, described as a "ratchet effect", has shown little sign of decreasing. When violence flares, it tends to be in interface areas. The highest levels of segregation in the city are in west Belfast with many areas greater than 90% Catholic. Opposite but comparatively high levels are seen in the predominantly Protestant east Belfast. Areas where segregated working-class areas meet are known as interface areas and sometimes marked by peace lines. Judging by the fact that 6.6% of the population was born outside the UK, it is probable that Belfast is around 92.5% White Irish/British and 3.3% non-White. This makes the city about as ethnically diverse as Sunderland or York. Musicians and bands who have written songs about or dedicated to Belfast: U2, Van Morrison, Snow Patrol, Simple Minds, Elton John, Rogue Male, Katie Melua, Boney M, Paul Muldoon, Stiff Little Fingers, Nanci Griffith, Glenn Patterson, Orbital, James Taylor, Fun Boy Three, Spandau Ballet, The Police, Barnbrack, Gary Moore, Neon Neon, Toxic Waste, and Energy Orchard, Billy Bragg. Further in Belfast the Oh Yeah Music Centre is located (Cathedral Quarter), a project founded to give young musicians and artists a place where they can share ideas and kick-start their music careers as a chance to be supported and promoted by professional musicians of Northern Ireland's music-scene. The Northern Ireland national football team, ranked 43rd in October 2014 in the FIFA World Rankings, plays its home matches at Windsor Park. The current Irish League champions Crusaders are based at Seaview, in the north of the city. Other Premiership teams include 2008/09 champions Glentoran, Linfield and Cliftonville. Intermediate-level clubs are: Donegal Celtic, Dundela, Harland & Wolff Welders, Newington Youth, PSNI, Queen's University and Sport & Leisure Swifts, who compete in the NIFL Championship; Albert Foundry F.C., Ballysillan Swifts, Bloomfield F.C., Crumlin Star F.C., East Belfast F.C., Grove United F.C., Immaculata F.C., Malachians F.C., Orangefield Old Boys' Association F.C., Rosario Youth Club F.C., St Patrick's Young Men F.C., Shankill United F.C., Short Brothers F.C. and Sirocco Works F.C. of the Northern Amateur Football League and Brantwood of the Ballymena & Provincial League. Belfast was the home town of Manchester United legend George Best who died in November 2005. On the day he was buried in the city, 100,000 people lined the route from his home on the Cregagh Road to Roselawn cemetery. Since his death the City Airport was named after him and a trust has been set up to fund a memorial to him in the city centre. Belfast has two universities. Queen's University Belfast was founded in 1845 and is a member of the Russell Group, an association of 24 leading research-intensive universities in the UK. It is one of the largest universities in the UK with 25,231 undergraduate and postgraduate students spread over 250 buildings, 120 of which are listed as being of architectural merit. Ulster University, created in its current form in 1984, is a multi-centre university with a campus in the Cathedral Quarter of Belfast. The Belfast campus has a specific focus on Art and Design and Architecture, and is currently undergoing major redevelopment. The Jordanstown campus, just seven miles (11 km) from Belfast city centre concentrates on engineering, health and social science. The Coleraine campus, about 55 mi (89 km) from Belfast city centre concentrates on a broad range of subjects. Course provision is broad – biomedical sciences, environmental science and geography, psychology, business, the humanities and languages, film and journalism, travel and tourism, teacher training and computing are among the campus strengths. The Magee campus, about 70 mi (113 km) from Belfast city centre has many teaching strengths; including business, computing, creative technologies, nursing, Irish language and literature, social sciences, law, psychology, peace and conflict studies and the performing arts. The Conflict Archive on the INternet (CAIN) Web Service receives funding from both universities and is a rich source of information and source material on the Troubles as well as society and politics in Northern Ireland. ^ a b "Belfast City Council". http://www.belfastcity.gov.uk/council/Yourcouncil/yourcouncil.aspx. Retrieved 22 February 2016. ^ Wakefield, Edward. An account of Ireland, statistical and political: in two volumes. 2. London: Longman, Hurst, Rees, Orme and Brown. pp. 693–694. https://books.google.com/books?id=YeI_AAAAcAAJ&pg=PA693. ^ "Census for post 1821 figures". Cso.ie. Archived from the original on 20 September 2010. https://web.archive.org/web/20100920090814/http://cso.ie/census. Retrieved 12 August 2010. ^ "Home". Histpop.Org. 2 April 2007. http://www.histpop.org. Retrieved 13 November 2010. ^ NISRA. "Northern Ireland Statistics and Research Agency – Census Home Page". Nisranew.nisra.gov.uk. Archived from the original on 4 April 2010. https://web.archive.org/web/20100404114651/http://www.nisranew.nisra.gov.uk/census/. Retrieved 12 August 2010. ^ Lee, JJ (1981). "On the accuracy of the Pre-famine Irish censuses". In Goldstrom, J. M.; Clarkson, L. A.. Irish Populatioe, Economy, and Society: Essays in Honour of the Late K. H. Connell. Oxford, England: Clarendon Press. ^ "Belfast City Council. Belfast: A Profile of the City. Demographics". Belfastcity.gov.uk. Archived from the original on 25 September 2010. http://www.belfastcity.gov.uk/factsandfigures/demographics.asp. Retrieved 12 August 2010. ^ "The World According to GaWC 2012". Globalization and World Cities (GaWC) Study Group and Network. Loughborough University. http://www.lboro.ac.uk/gawc/world2012t.html. Retrieved 15 February 2014. ^ a b c d "Placenames Database of Ireland – Belfast: view the scanned records". Logainm.ie. http://www.logainm.ie/118005.aspx. Retrieved 25 May 2014. ^ a b "Placenames/Logainmneacha – Belfast". BBC Northern Ireland – Education. BBC. http://www.bbc.co.uk/northernireland/irish/blas/education/beginnersblas/1belfast.shtml. Retrieved 17 May 2007. ^ Keenan, Desmond (2000). Pre-Famine Ireland. XLibris.com. Chapter 5. http://www.deskeenan.com/4PrChapter5.htm. ^ "Placenames Database of Ireland – Belfarsad". Logainm.ie. http://www.logainm.ie/37016.aspx. Retrieved 13 November 2010. ^ Hogan, Edmund (1910). Onomasticon Goedelicum. Dublin. http://publish.ucc.ie/doi/locus/B. ; O'Donovan, John (1856). Annals of the Kingdom of Ireland. Dublin. https://archive.org/stream/annalarioghachta04ocle#page/1100/mode/2up. ^ "Ulster Scots Language & Dialects of Ulster". The Linen Hall Library. https://www.linenhall.com/pages/irish-and-reference. Retrieved 3 March 2016. ^ "North-South Ministerial Council: 2010 Annual Report in Ulster Scots" (PDF). http://www.northsouthministerialcouncil.org/annual_report_2010_ulster_scots.pdf. Retrieved 2 August 2014. ^ "North-South Ministerial Council: 2009 Annual Report in Ulster Scots" (PDF). http://www.northsouthministerialcouncil.org/ulster_scots_nsmc_2009_annual_report-3.pdf. Retrieved 2 August 2014. ^ "Belfast City Hall". Discover Northern Ireland. Ireland Tourist Board. Archived from the original on 16 June 2007. http://www.discovernorthernireland.com/product.aspx?ProductID=2782. Retrieved 18 May 2007. ^ "Belfast, Newcastle and the County Down Coast". County Down Northern Ireland. GoIreland.com. Archived from the original on 19 December 2008. http://www.countydown.com/. Retrieved 17 January 2009. ^ "A walk on the outskirts of Belfast: Giant's Ring Trail, Northern Ireland". The Guardian. 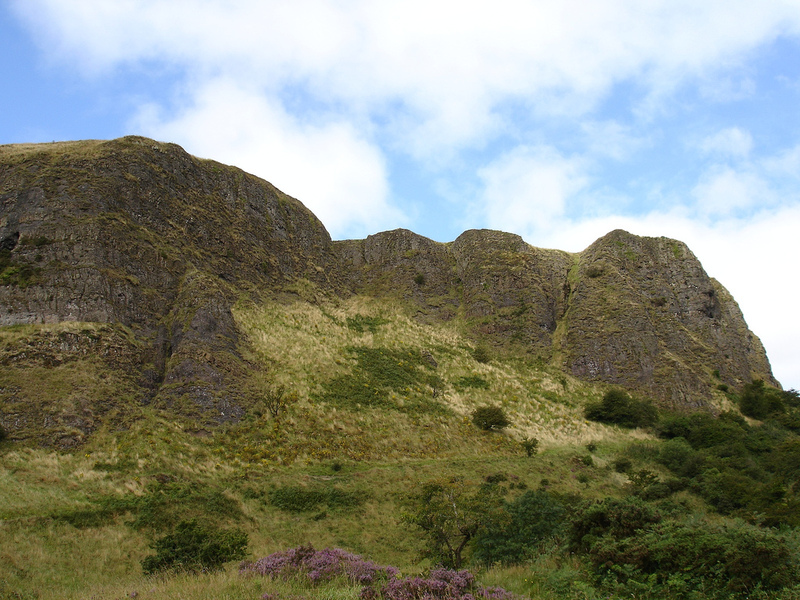 12 May 2012. http://www.theguardian.com/travel/2012/may/12/giants-ring-trail-belfast-walk. Retrieved 1 June 2014. ^ Komesu, Okifumi (1990). Irish Writers and Politics. Rowman & Littlefield. p. 73. ISBN 978-0-389-20926-3. https://books.google.com/?id=AwFO2Z8Bk0YC&pg=PA73. ^ "Celebrations mark the arrival of first Ulster Scots in Ireland" (PDF). Irish News. 24 April 2006. Archived from the original on 27 September 2007. https://web.archive.org/web/20070927114138/http://www.theflightoftheearls.net/May2406.pdf. Retrieved 18 September 2007. ^ "History of Belfast Castle". Tourism and venues. Belfast City Council. 2014. http://www.belfastcity.gov.uk/tourism-venues/belfastcastle/bchistory.aspx. Retrieved 19 May 2014. ^ "Cranes to remain on city skyline". BBC News. 9 October 2003. http://news.bbc.co.uk/1/hi/northern_ireland/3176184.stm. Retrieved 12 March 2007. ^ Ryland, Frederick (1897). Events of the Reign 1837–1897. London: George Allen. p. 101. OCLC 267093697. https://books.google.com/books?id=lw4QAAAAYAAJ&pg=PA101. ^ "The Belfast blitz is remembered". BBC News. 11 April 2001. http://news.bbc.co.uk/1/hi/northern_ireland/1269206.stm. Retrieved 12 March 2007. ^ Kelters, Seamus (February 2013). "Violence in the Troubles". History. BBC. http://www.bbc.co.uk/history/topics/troubles_violence. Retrieved 19 May 2014. ^ "Sutton Index of Deaths". CAIN. 11 April 2001. http://cain.ulst.ac.uk/sutton/search.html. Retrieved 9 July 2013. "Search for Belfast in "Text Search of Description (and key words)""
^ "Belfast City Hall: History and Background". Belfast City Council. Archived from the original on 4 May 2007. http://www.belfastcity.gov.uk/cityhall/history.asp?menuitem=background. Retrieved 24 May 2007. ^ "Local Government (Boundaries) Act (Northern Ireland) 1971". Conflict Archive on the Internet (CAIN). 2007. Archived from the original on 7 July 2007. http://cain.ulst.ac.uk/hmso/lgba1971.htm. Retrieved 24 May 2007. ^ a b "Councillors: Lord Mayor". Belfast City Council. Archived from the original on 7 June 2007. http://www.belfastcity.gov.uk/councillors/index.asp?menuitem2=lord-mayor. Retrieved 24 May 2007. ^ "Belfast City Council Elections 1993–2005". Northern Ireland Elections. Northern Ireland Social and Political Archive (ARK). 2005. Archived from the original on 8 June 2007. http://www.ark.ac.uk/elections/lgbelfast.htm. Retrieved 24 May 2007. ^ "Belfast signs Sister Cities accord with Boston". belfastcity.gov.uk. http://www.belfastcity.gov.uk/News/News-37859.aspx. ^ "Sister Cities Online Directory: UK, Europe Sister Cities International. Retrieved 17 November 2011. ^ Black, Rebecca (25 March 2014). "Belfast and Boston to be named sister cities –". Belfasttelegraph.co.uk. http://www.belfasttelegraph.co.uk/news/northern-ireland/belfast-and-boston-to-be-named-sister-cities-30121801.html. Retrieved 2 August 2014. ^ Ellement, John (12 May 2014). "Boston signs sister city agreement with Belfast". Boston Globe. http://www.bostonglobe.com/metro/2014/05/12/boston-inks-sister-city-agreement-with-belfast-home-titanic-and-game-thrones-series/hsCs7ou297cfFalfWCu9TM/story.html. Retrieved 12 May 2014. ^ "Northern Ireland election". BBC News. 8 May 2016. http://www.bbc.co.uk/news/election/2016/northern_ireland/resultsm. Retrieved 11 May 2016. ^ "The 2005 Westminster elections in Northern Ireland". Northern Ireland Elections. Northern Ireland Social and Political Archive (ARK). 2005. Archived from the original on 8 June 2007. http://www.ark.ac.uk/elections/fw05.htm. Retrieved 24 May 2007. ^ a b Brett, C. E. B. (1967). Buildings of Belfast, 1700–1914. London: Weidenfeld and Nicolson. ^ a b c "Introduction To Titanic – Titanic in History". Titanic. Built in Belfast. Ulster Folk and Transport Museum. Archived from the original on 17 August 2007. http://www.titanicinbelfast.com/template.aspx?pid=342&area=1&parent=321. Retrieved 18 May 2007. ^ "Sunrise and sunset in Belfast". Sun Calculator. time and date.com. http://www.timeanddate.com/astronomy/uk/belfast. Retrieved 18 May 2007. ^ "Lagan Weir – Why it exists". Laganside. Archived from the original on 18 April 2007. https://web.archive.org/web/20070418044643/http://www.laganside.com/laganweir.asp. Retrieved 25 May 2007. ^ "Area Measurements in Northern Ireland". 2001 census Data. Northern Ireland Statistics & Research Agency. 2001. Archived from the original on 17 June 2007. https://web.archive.org/web/20070617083217/http://www.nisranew.nisra.gov.uk/census/area_measurement.html. Retrieved 18 May 2007. ^ "Belfast City: Did you know?". Discover Ireland. Tourism Ireland. 2007. Archived from the original on 28 September 2007. https://web.archive.org/web/20070928125051/http://www.discoverireland.com/za/ireland-places-to-go/areas-and-cities/belfast-city/highlights/culture/. Retrieved 18 May 2007. ^ "Belfast Hills". Discover Northern Ireland. Northern Ireland Tourist Board. http://www.discovernorthernireland.com/Belfast-Hills-Dunmurry-Belfast-P10391. Retrieved 18 May 2007. ^ "About the Cave Hill". The Cave Hill Conservation Campaign. 2007. Archived from the original on 6 February 2007. https://web.archive.org/web/20070206154855/http://www.cavehill.freeuk.com/home.htm. Retrieved 25 May 2007. ^ "Station Locations". http://www.metoffice.gov.uk/public/weather/climate-extremes. Retrieved 23 September 2011. ^ a b c "Climate: Northern Ireland". Met Office. http://www.metoffice.gov.uk/climate/uk/regional-climates/ni. Retrieved 25 May 2007. ^ "2001 Minimum". http://www.metoffice.gov.uk/public/weather/climate-extremes. Retrieved 23 September 2011. ^ "Belfast, Northern Ireland – Average Conditions". BBC Weather Centre. BBC. Archived from the original on 15 January 2009. https://web.archive.org/web/20090115035401/http://www.bbc.co.uk/weather/world/city_guides/city.shtml?tt=TT003750. Retrieved 8 October 2009. ^ "Rainfall in Ireland". Met Éireann. Archived from the original on 2 June 2007. http://www.met.ie/climate/rainfall.asp. Retrieved 25 May 2007. ^ "1983 Maximum". http://eca.knmi.nl/utils/monitordetail.php?seasonid=13&year=1983&indexid=TXx&stationid=1821. Retrieved 23 September 2011. ^ "1971–2000 average warmest day". http://eca.knmi.nl/utils/calcdetail.php?seasonid=0&periodid=1971-2000&indexid=TXx&stationid=1821. Retrieved 23 September 2011. ^ ">25c days". http://eca.knmi.nl/utils/calcdetail.php?seasonid=0&periodid=1971-2000&indexid=SU&stationid=1821. Retrieved 23 September 2011. ^ ">Jan 1982 Minimum". http://eca.knmi.nl/utils/monitordetail.php?seasonid=7&year=1982&indexid=TNn&stationid=1821. Retrieved 23 September 2011. ^ ">Air frost Incidence". http://eca.knmi.nl/utils/calcdetail.php?seasonid=0&periodid=1971-2000&indexid=FD&stationid=1821. Retrieved 23 September 2011. ^ ">Dec 2010 minimum". http://metofficenews.wordpress.com/2010/12/22/. Retrieved 23 September 2011. ^ "Annual average warmest day". http://eca.knmi.nl/utils/calcdetail.php?seasonid=0&periodid=1971-2000&indexid=TXx&stationid=1640. Retrieved 22 September 2011. ^ ">25c days". http://eca.knmi.nl/utils/calcdetail.php?seasonid=0&periodid=1971-2000&indexid=SU&stationid=1640. Retrieved 22 September 2011. ^ ">Annual average coldest night". http://eca.knmi.nl/utils/calcdetail.php?seasonid=0&periodid=1971-2000&indexid=TNn&stationid=1640. Retrieved 22 September 2011. ^ ">Average frost incidence". http://eca.knmi.nl/utils/calcdetail.php?seasonid=0&periodid=1971-2000&indexid=FD&stationid=1640. Retrieved 22 September 2011. ^ "Belfast 1981-2010 Averages". KNMI. http://eca.knmi.nl/utils/mapserver/climatology.php?indexcat=**&indexid=TX&periodidselect=1981-2010&seasonid=7&scalelogidselect=no&minx=-783333.333333&miny=-5423809.523810&maxx=2683333.333333&maxy=-2823809.523809&MapSize=560%2C420&imagewidth=560&imageheight=420&CMD=ZOOM_IN&CMD=QUERY_POINT#bottom. Retrieved 15 June 2016. ^ "Belfast Extreme Values". KNMI. http://eca.knmi.nl/indicesextremes/customquerytimeseriesplots.php. Retrieved 15 June 2016. ^ "Belfast International Airport (Aldergrove) 1981–2010 averages". Met Office. http://www.metoffice.gov.uk/public/weather/climate/gcewfr7bf. Retrieved 4 November 2012. ^ "Belfast International Airpoirt (Aldergrove) extreme values". KNMI. http://eca.knmi.nl/indicesextremes/customquerytimeseriesplots.php. Retrieved 8 November 2011. ^ Margrethe C. Lauber. "Belfast's Peacelines: An Analysis of Urban Borders, Design and Social Space in a Divided City". Retrieved on 18 May 2007. ^ ""A Process for Removing Interface Barriers", Tony Macaulay, July 2008" (PDF). http://www.macaulayassociates.co.uk/pdfs/peace_wall.pdf. Retrieved 12 August 2010. ^ "Major makeover for Belfast city Centre". Department for Social Development (NI). 12 June 2007. Archived from the original on 28 September 2007. https://web.archive.org/web/20070928104438/http://www.dsdni.gov.uk/index/news_items/major-makover-belfast.htm. Retrieved 12 June 2007. ^ "The Arterial Routes". Belfast Metropolitan Area Plan 2015 Draft Plan. The Planning Service. Archived from the original on 18 May 2014. https://web.archive.org/web/20140518205005/http://www.planningni.gov.uk/de/index/policy/dev_plans/devplans_az/bmap_2015/bmap_district_proposals/bmap_belfast/bmap_belfast_city/bmap_belfast_city_routes/bmap_arterialroutes_strategy.htm. Retrieved 18 May 2014. ^ "The UK Postcode System". List Masters. 2005. Archived from the original on 24 June 2007. https://web.archive.org/web/20070624020159/http://www.listmasters.co.uk/postcodes.php. Retrieved 12 June 2007. ^ a b "The Cathedral Quarter, Belfast". Northern Ireland Tourist Board. 2014. http://www.discovernorthernireland.com/belfast/The-Cathedral-Quarter-Belfast-A2042. Retrieved 18 May 2014. ^ "Gaeltacht Quarter". Department of Culture, Arts and Leisure. 2007. Archived from the original on 27 September 2007. https://web.archive.org/web/20070927032912/http://www.dcalni.gov.uk/index/languages/gaeltacht_quarter.htm. Retrieved 15 January 2016. ^ "Contact Details". The Ulster Museum. 2007. Archived from the original on 29 May 2007. http://www.ulstermuseum.org.uk/contact-us/contact-details/. Retrieved 18 May 2007. ^ "The Golden Mile: Pub Crawl". Virtual Belfast. Archived from the original on 24 June 2007. http://www.belfastbar.co.uk/The-Golden-Mile-articles.htm. Retrieved 25 May 2007. ^ "Shopping at a Glance". Visit South Belfast. South Belfast Partnership. Archived from the original on 17 July 2011. https://web.archive.org/web/20110717222117/http://www.visitsouthbelfast.com/tourism/default.asp?cms=Tourism_Things+To+Do_Shopping_Shopping+At+A+Glance&cmsid=19_49_81_227&id=227&viewtype=Category. Retrieved 18 May 2007. ^ Burns, Gemma (28 February 2007). "A passion for preserving Belfast's beauty". South Belfast News. http://www.dailyireland.com/home.tvt?_scope=DailyIreland/South%20Belfast%20News/Features&id=26382&psv=13&_ticket=9NTHLXD4YGSGX4SGPNNADY7BZKLAFUUGUYRIJQOJBVXF9LLDN32STRRIVON9ANVRBNKACJ5J9QRFK11M9NTGNXT9CHUT71QFIRY4S0SEAOYFBHSJ5LE1HONDNMTEGPKACN1FURUQS10YM75OV6. Retrieved 12 March 2007. ^ a b "Corporate Message: The Vision". About Us at Titanic Quarter. Titanic Quarter. 2006. Archived from the original on 3 May 2007. http://www.titanic-quarter.com/about.php?ID=3. Retrieved 18 May 2007. ^ Krishna, Dutta (2003). Calcutta: A Cultural and Literary History. Signal Books. p. 132. ISBN 978-1-902669-59-5. https://books.google.com/?id=UKfoHi5412UC&pg=PA132. ^ Wines, Michael (25 May 2006). "Where the Road to Renaming Does Not Run Smooth". The New York Times. Archived from the original on 16 April 2009. https://web.archive.org/web/20090416052505/http://www.nytimes.com/2007/05/25/world/africa/25durban.html?_r=1&oref=slogin. Retrieved 1 October 2007. ^ a b c "Historic Belfast: A guide to the City's landmark buildings". Go To Belfast. Archived from the original on 18 June 2007. https://web.archive.org/web/20070618164651/http://www.gotobelfast.com/index.cfm/level/page/category_key/197/Page_Key/428/Parent_Key/0/type/Page/PaGeName/Historic_Buildings_of_Belfast. Retrieved 23 May 2007. ^ Morgan, Ian (4 March 2007). "Ireland's tallest building to be turned into flats". 24dash.com. Archived from the original on 29 September 2007. http://www.24dash.com/printNews/1/17408.htm. Retrieved 2 June 2007. ^ "BBC seeks stars of Belfast film noir". BBC News Northern Ireland. 23 February 2007. http://news.bbc.co.uk/1/hi/northern_ireland/6388303.stm. Retrieved 23 May 2007. ^ "Harland and Wolff complete SeaRose Dry-Docking project". Harland and Wolff. http://www.harland-wolff.com/News/HARLAND-AND-WOLFF-COMPLETE-SEAROSE-DRY-DOCKING-PRO.aspx. Retrieved 20 June 2014. ^ "Grand Opera House". Cinema Treasures. http://cinematreasures.org/theaters/2061. Retrieved 1 June 2007. ^ "Neeson in bid to revive theatre". BBC News. 10 December 2004. Archived from the original on 16 January 2008. https://web.archive.org/web/20080116220650/http://news.bbc.co.uk/1/hi/northern_ireland/4083973.stm. Retrieved 7 December 2007. ^ a b "Parks and gardens". gotobelfast. 1 April 2007. http://visit-belfast.com/things-to-do/category/attractions/parks-and-gardens. Retrieved 16 May 2009. ^ "Why city art is being put on the map". BBC News. http://news.bbc.co.uk/1/hi/northern_ireland/5120974.stm. Retrieved 18 May 2014. ^ "Your City, Your Space strategy". Belfast City Council. p. 49. Archived from the original on 7 February 2012. https://web.archive.org/web/20120207183843/http://www.belfastcity.gov.uk/parksandopenspaces/openspacestrategyfunding.pdf. Retrieved 18 May 2007. ^ "About the Field Club". Belfast Naturalists' Field Club. http://www.bnfc.org.uk/BNFC/History.html. Retrieved 18 May 2014. ^ "Palm House Botanic Gardens, Belfast City". Houses, Castles and Gardens of Ireland. Archived from the original on 13 May 2008. https://web.archive.org/web/20080513021454/http://www.gardensireland.com/palm-house.html. Retrieved 18 May 2007. ^ "Tropical Ravine". Belfast City Council. Archived from the original on 17 May 2009. http://www.belfastcity.gov.uk/parksandopenspaces/tropicalravine.asp. Retrieved 30 May 2009. ^ a b "Sir Thomas and Lady Dixon Park and City of Belfast International Rose Garden". Go To Belfast. Archived from the original on 31 May 2007. https://web.archive.org/web/20070531190626/http://www.gotobelfast.com/thingstodo/viewdetail.cfm/TDVenue_Key/421/level/page/category_key/197/Page_Key/279/parent_key/0/type/Page/PaGeName/Restaurant_Month.htm. Retrieved 18 May 2007. ^ "Sir Thomas and Lady Dixon Park". Discover Northern Ireland. Northern Ireland Tourist Board. Archived from the original on 15 June 2007. http://www.discovernorthernireland.com/product.aspx?ProductID=2795. Retrieved 18 May 2007. ^ "Parks and gardens". belfastzoo. 1 April 2007. Archived from the original on 14 April 2009. https://web.archive.org/web/20090414005143/http://www.belfastzoo.co.uk/aboutbelfastzoo/HistoryofBelfastZoo.aspx. Retrieved 16 May 2009. ^ a b c "Comparative Demography Profile: Belfast District Council, Northern Ireland". 2001 census data (Crown Copyright). Northern Ireland Statistics & Research Agency. 2001. Archived from the original on 27 September 2007. https://web.archive.org/web/20070927161000/http://www.nicensus2001.gov.uk/nica/browser/profile.jsp?profile=Demography&mainLevel=CouncilArea&mainArea=Belfast&mainText=&mainTextExplicitMatch=null&compLevel=CountryProfile&compArea=Northern+Ireland&compText=&compTextExplicitMatch=null. Retrieved 17 May 2007. ^ a b "Area Profile of Belfast Metropolitan Urban Area (BMUA)". 2001 Census data. Northern Ireland Statistics & Research Agency. 2001. Archived from the original on 27 September 2007. https://web.archive.org/web/20070927001507/http://www.ninis.nisra.gov.uk/mapxtreme_towns/report.asp?settlementName=Belfast%20Metropolitan%20Urban%20Area%20(BMUA)&BandName=Belfast%20Metropolitan%20Urban%20Area%20(BMUA). Retrieved 16 May 2007. ^ Pointer, Graham. "The UK's major urban areas" (PDF). UK National Statistics. Archived from the original on 30 November 2007. http://www.statistics.gov.uk/downloads/theme_compendia/fom2005/03_FOPM_UrbanAreas.pdf. Retrieved 7 December 2007. ^ a b Stephen, Roulston (2006). "Urban Structure: Growth of Belfast". Geography in Action. National Grid for Learning. Archived from the original on 15 April 2007. http://www.geographyinaction.co.uk/Urban_structure/Urban_growth.html. Retrieved 18 May 2007. ^ "Population Density: QS102NI (administrative geographies)". Northern Ireland Statistics and Research Agency. 2011. http://www.ninis2.nisra.gov.uk/public/PivotGrid.aspx?ds=3956&lh=73&yn=2011&sk=136&sn=Census%202011&yearfilter=. Retrieved 30 May 2014. ^ "Northern Ireland Multiple Deprivation Measure" (PDF). Department of Finance and Personnel. May 2005. Archived from the original on 5 June 2007. http://www.nisra.gov.uk/archive/deprivation/NIMDM2005FullReport.pdf. Retrieved 18 May 2007. ^ Stephen, Roulston (2006). "Ethnic Diversity: Segregation in Belfast. Introduction to Ethnic Diversity in Belfast". Geography in Action. National Grid for Learning. Archived from the original on 18 May 2007. http://www.geographyinaction.co.uk/Ethnic%20Diversity/Ethnic_intro.html. Retrieved 18 May 2007. ^ Lloyd, C (2003). "Measuring local segregation in Northern Ireland" (PDF). Centre for Spatial Territorial Analysis and Research (C-STAR). Retrieved on 12 March 2006. ^ Doherty, P (1995). "Ethnic Residential Segregation in Belfast". Centre for the Study of Conflict: Chapter 8. Retrieved on 12 March 2006. ^ "Ethnic minorities: Who lives here?" (PDF). Northern Ireland Learning: Teacher's Notes. BBC. Archived from the original on 5 June 2007. http://www.bbc.co.uk/northernireland/schools/11_16/citizenship/pdfs/ctz_eth_pg02_tn.pdf. Retrieved 24 May 2007. ^ a b c d "Northern Ireland Neighbourhood Information Service". http://www.ninis2.nisra.gov.uk/Download/Census%202011_Excel/2011/QS208NI%20(a).xls. Retrieved 11 June 2015. ^ a b "Northern Ireland Neighbourhood Information Service". http://www.ninis2.nisra.gov.uk/Download/Census%202011/KS201NI%20(a).xlsx. Retrieved 11 June 2015. ^ "About Us". Belfast Islamic Centre. 2007. http://belfastislamiccentre.org.uk/about_us/about_us.htm. Retrieved 24 May 2007. ^ "Hinduism". Primary Focus: Programme 1 – Indian Community. BBC. http://www.bbc.co.uk/northernireland/schools/4_11/pfocus/citizenship/spring2001/. Retrieved 8 October 2007. ^ "Durkan "hopeful" For Future of Good Friday Agreement". Department of Finance and Personnel. Archived from the original on 12 October 2007. https://web.archive.org/web/20071012210212/http://archive.nics.gov.uk:80/dfp/010209f-dfp.htm. Retrieved 17 September 2007. ^ "House of Commons Hansard Written Answers for 13 February 2002". House of Commons. http://www.publications.parliament.uk/pa/cm200102/cmhansrd/vo020213/text/20213w02.htm. Retrieved 17 September 2007. ^ "U2 Tower strikes bad chord with residents". BBC News. 7 August 2006. http://news.bbc.co.uk/2/hi/uk_news/northern_ireland/5251794.stm. Retrieved 13 March 2007. ^ "Monthly Labour Market Report". Department of Enterprise, Trade and Investment. 15 February 2006. Archived from the original on 27 September 2007. https://web.archive.org/web/20070927223435/http://www.detini.gov.uk/cgi-bin/downdoc?id=1941. Retrieved 18 May 2007. ^ "Employment". National Statistics. Office for National Statistics. March 2006. Archived from the original on 18 May 2007. http://www.statistics.gov.uk/cci/nugget.asp?id=12. Retrieved 18 May 2007. ^ Morgan, Oliver (1 April 2007). "From bombs and bullets to boom towns". The Guardian (London). http://www.theguardian.com/business/2007/apr/01/northernireland.theobserver. Retrieved 16 May 2007. ^ "Northern Ireland Reaches Watershed in House Price Growth" (Press release). University of Ulster. 15 November 2007. http://news.ulster.ac.uk/releases/2007/3504.html. Retrieved 10 December 2007. ^ Carson, Helen (28 February 2007). "Typical price of Ulster home edges ever closer to £200,000". The Belfast Telegraph. http://www.belfasttelegraph.co.uk/news/local-national/article2311541.ece. Retrieved 13 March 2007. ^ "House Owner Occupation Rates" (DOC) (Press release). Halifax. 19 November 2004. Archived from the original on 5 June 2007. https://web.archive.org/web/20070605142713/http://www.hbosplc.com/economy/includes/19-11-04UKowneroccupation.doc. Retrieved 18 May 2007. ^ Belfast 2005: Tourism Facts and Figures. Belfast: Belfast City Council. 2006. Archived from the original on 5 June 2007. http://www.belfastcity.gov.uk/tourism/docs/FactsFigures2005.pdf. Retrieved 18 May 2007. ^ "Record number of visitors come to Belfast". GO Belfast: p. 6. July–August 2007. ^ "Invest in Belfast: A 2007 City Guide for Investors". Belfast City Council. Archived from the original on 10 October 2007. https://web.archive.org/web/20071010040408/http://www.belfastcity.gov.uk/investinbelfastguide/lifequality.asp. Retrieved 18 May 2007. ^ "Belfast 'UK's fastest-growing economy'". Wilson-nesbitt.com. 30 June 2008. Archived from the original on 18 July 2011. https://web.archive.org/web/20110718052816/http://www.wilson-nesbitt.com/articles/841/30062008/belfast_uks_fastest-growing_economy. Retrieved 12 August 2010. ^ a b "Northern Ireland – Overview". The Times. Bcglocations.com. Archived from the original on 4 November 2006. https://web.archive.org/web/20061104103706/http://www.bcglocations.com/uk/northernireland/northernireland_intro.html. Retrieved 12 August 2010. ^ "The New Celtic Tiger: Belfast is Open for Business". Der Spiegel. 4 July 2008. http://www.spiegel.de/international/business/the-new-celtic-tiger-belfast-is-open-for-business-a-563841.html. Retrieved 12 August 2010. ^ a b c Beckett, JC (2003). Belfast, The Making of the City. Chapter 1: Belfast to the end of the eighteenth century. Belfast: Appletree Press Ltd. pp. 13–26. ISBN 0-86281-878-8. ^ McCreary, Alf (22 January 2014). "The Industrial Revolution transformed Belfast, making it Ireland's biggest city – and it all began with the port.". The Belfast Telegraph. http://www.belfasttelegraph.co.uk/archive/belfast-400/the-industrial-revolution-transformed-belfast-making-it-irelands-biggest-city-and-it-all-began-with-the-port-29224161.html. Retrieved 25 May 2014. ^ a b Beckett, JC; Boyle, E (2003). Belfast, The Making of the City. Chapter 3: "Linenopolis": the rise of the textile industry. Belfast: Appletree Press Ltd. pp. 41–56. ISBN 0-86281-878-8. ^ Beckett, JC; Sweetman, R (2003). Belfast, The Making of the City. Chapter 4: The development of the port. Belfast: Appletree Press Ltd. pp. 57–70. ISBN 0-86281-878-8. ^ "Corporate Series Northern Ireland" (PDF). Corporate Northern Ireland 2007. Corporate Series. Archived from the original on 16 February 2008. https://web.archive.org/web/20080216070011/http://www.corporateseries.com/nireland/07/CNI_section07.pdf. Retrieved 7 December 2007. ^ a b (23 March 2006) "Northern Ireland – Where is the bright new future?". Management Today. Retrieved on 16 May 2007. ^ "The Silent Valley". Northern Ireland Water. 2007. http://www.niwater.com/silent-valley/. Retrieved 30 May 2014. ^ a b c "Strategic Plan Framework: Public Services and Utilities". Draft Belfast Metropolitan Area Plan 2015. The Planning Service. Archived from the original on 27 September 2007. https://web.archive.org/web/20070927095510/http://www.planningni.gov.uk/areaplans_policy/Plans/BMA/draft_plan/01Part1_3/03Strategic_Framework/publics_u.htm. Retrieved 26 May 2007. ^ "Water Reform Implemented: Secretary of State announces deferral of charges". Water Reform NI. March 2007. Archived from the original on 9 June 2007. http://www.waterreformni.gov.uk/. Retrieved 26 May 2007. ^ "Belfast Sewers Project – Key Facts". Northern Ireland Water. 2007. http://www.niwater.com/belfastsewersproject.asp. Retrieved 26 May 2007. ^ "Summary of domestic rating reforms". Department of Finance and Personnel. 2005. Archived from the original on 5 May 2007. http://www.ratingreviewni.gov.uk/index/domestic/domestic-summary.htm. Retrieved 26 May 2007. ^ "Domestic Rates Reform". Fair Rates Campaign. http://www.fairratescampaign.co.uk/rates_reform.html. Retrieved 26 May 2007. ^ "Review of Public Administration: Consultation On Draft Legislation To Establish Five New Integrated Health And Social Services Trusts" (PDF). DHSSPS. Archived from the original on 27 September 2007. http://www.dhsspsni.gov.uk/hpssreview-trust-consultation-document.pdf. Retrieved 17 September 2007. ^ Payne, William (September 1998). "Hospital Development:PFI beyond DBFO". ProQuest Information and Learning Company. Retrieved on 6 May 2007. ^ (2006) "Improving cancer statistics – a new cancer centre for Northern Ireland". The Ulster medical journal 75 (2). PMID 16755938. ^ "Belfast City Hospital: About the Unit". The Renal Association. November 2006. http://www.renal.org/bapn/bapn-information-and-resources/centres/lists/centres/belfast. Retrieved 24 May 2007. ^ "TRH open Northern Ireland's first Regional Acquired Brain Injury Unit". The Prince of Wales. 15 May 2006. Archived from the original on 7 March 2007. https://web.archive.org/web/20070307071451/http://www.princeofwales.gov.uk/newsandgallery/news/trh_open_northern_ireland_s_first_regional_acquired_brain_in_778.html. Retrieved 6 May 2007. ^ "M2 / M22 Motorway". Wesleyjohnston.com. http://www.wesleyjohnston.com/roads/m2.html. Retrieved 12 August 2010. ^ a b Northern Ireland Statistics and Research Agency (18 October 2005). "Travel Survey for Northern Ireland 2002–04" (PDF). Retrieved on 6 May 2007. ^ "The Official Opening of the M1/Westlink Improvement Scheme". The Department for Regional Development. 12 March 2009. Archived from the original on 27 December 2010. https://web.archive.org/web/20101227104252/http://www.drdni.gov.uk/index/publications/publications-details.htm?docid=5070. Retrieved 1 February 2011. ^ "Road Improvements Schemes – In Planning". The Department for Regional Development NI. http://www.drdni.gov.uk/index/roadimprovements/schemes.htm. ^ "York Street Interchange – Scheme Homepage". The Department for Regional Development NI. 26 November 2009. Archived from the original on 10 June 2013. https://web.archive.org/web/20130610042038/http://www.drdni.gov.uk/index/roadimprovements/schemes/yorkstreet.htm. ^ Nutley, Stephen D. (1990). Unconventional and Community Transport in the United Kingdom. Gordon and Breach Science Publishers. pp. 318–322. ISSN 0278-3819. https://books.google.com/books?id=k5rrC4nYek8C&pg=PA318. ^ "Metro Corridor & Zone Guide". Translink Metro. 27 August 2012. http://www.translink.co.uk/Services/Metro-Service-Page/Metro-Corridor-Zone-Guide. Retrieved 2 June 2014. ^ "video No light rail system for city". BBC News. 8 April 2008. http://news.bbc.co.uk/player/nol/newsid_7330000/newsid_7336800/7336822.stm?bw=bb&mp=wm&news=1&bbcws=1. Retrieved 30 May 2009. ^ "City to get rapid transit network". BBC Northern Ireland. 8 April 2008. Archived from the original on 9 April 2008. https://web.archive.org/web/20080409114158/http://news.bbc.co.uk/1/hi/northern_ireland/7335313.stm. Retrieved 4 April 2008. ^ Northern Ireland Statistics and Research Agency (28 September 2006). "Northern Ireland Transport Statistics Annual 2005–2006" (PDF). Retrieved on 2 May 2007. ^ "Summary of the bid". One Belfast Where Hope and History Rhyme (Internet Archive). Imagine Belfast 2008. 22 November 2002. Archived from the original on 7 December 2002. https://web.archive.org/web/20021207124752/www.imaginebelfast2008.com/front.html. Retrieved 24 May 2007. ^ "The official websites on UK bids for European capital of culture 2008". The Guardian (London). 30 October 2002. http://www.theguardian.com/society/regeneration/page/0,,774007,00.html. Retrieved 13 March 2007. ^ Ward, D; Carter, H (31 October 2002). "Six cities shortlisted for culture capital bid". The Guardian (London). http://www.theguardian.com/uk/2002/oct/31/travelnews.travel1. Retrieved 13 March 2007. ^ a b "Integrated Cultural Strategy for Belfast" (PDF). Capital City: Belfast City Councils Development Agenda. May 2006. http://www.belfastcity.gov.uk/culture/culturalstrategy.asp. Retrieved 24 May 2007. ^ "Welcome to the new season". Ulster Orchestra Society. Archived from the original on 5 February 2007. https://web.archive.org/web/20070205212256/http://www.ulster-orchestra.org.uk/concerts/welcome.html. Retrieved 24 May 2007. ^ "The History of Belfast Underground Clubs". http://www.belfastundergroundclubs.com. ^ "ComharthaÃ Bus Gaeilge san Iarthar / Irish language bus signs in the West | Here comes the new Belfast". Forbairtfeirste.com. http://www.forbairtfeirste.com/forbairt-news/comharthai-bus-gaeilge-san-iarthar-irish-language-bus-signs-in-the-west/. Retrieved 2 August 2014. ^ "Research Guide: Irish News & Newspapers". Boston College. 2007. Archived from the original on 9 August 2007. https://web.archive.org/web/20070809020149/http://www.bc.edu/libraries/research/guides/s-irishnews/. Retrieved 24 May 2007. ^ Johnston, Ruth. "Belfast News Letter". Your Place and Mine. BBC. http://www.bbc.co.uk/northernireland/yourplaceandmine/belfast/newsletter.shtml. Retrieved 24 May 2007. ^ "About Homely Planet". Homelyplanet.org. http://www.homelyplanet.org/about-homely-planet/. Retrieved 20 May 2014. ^ Henry, Lesley-Ann (2 March 2011). "MTV Europe Music Awards to be held in Belfast". The Belfast Telegraph. http://www.belfasttelegraph.co.uk/entertainment/mtv-awards/mtv-europe-music-awards-to-be-held-in-belfast-28665779.html. Retrieved 14 November 2011. ^ Jones, Lucy (6 November 2011). "MTV Europe Music Awards 2011: as it happened". The Daily Telegraph. http://www.telegraph.co.uk/culture/music/music-news/8871749/MTV-EMAs-2011-as-it-happened.html. Retrieved 20 May 2014. ^ "Belfast Marathon breaks 20,000 barrier". Belfast City Council. 18 April 2011. Archived from the original on 24 September 2011. https://web.archive.org/web/20110924105740/http://www.belfastcity.gov.uk/news/news.asp?id=2600&month=April%202011. Retrieved 9 July 2011. ^ "FIFA/Coca Cola World Rankings". FIFA. 11 November 2014. http://www.fifa.com/associations/association=nir/ranking/gender=m/index.html. Retrieved 11 November 2014. ^ McCann, Nuala (3 December 2005). "A city mourns for the Belfast Boy". BBC News Northern Ireland (BBC). http://news.bbc.co.uk/2/hi/uk_news/northern_ireland/4495026.stm. Retrieved 18 May 2005. ^ "George Best Memorial Trust". George Best Trust. Archived from the original on 29 September 2007. https://web.archive.org/web/20070929121852/http://www.georgebesttrust.com/. Retrieved 18 May 2007. ^ "Information and Statistics" (PDF). GAA Attendance Figures. Gaelic Athletic Association Gaelic Athletic Association. Archived from the original on 26 May 2006. http://www.gaa.ie/files/04arstat.pdf. Retrieved 18 May 2006. ^ "Antrim chief in protest at Maze games". Sunday Mirror. 13 March 2005. http://findarticles.com/p/articles/mi_qn4161/is_20050313/ai_n12944637. Retrieved 17 September 2007. 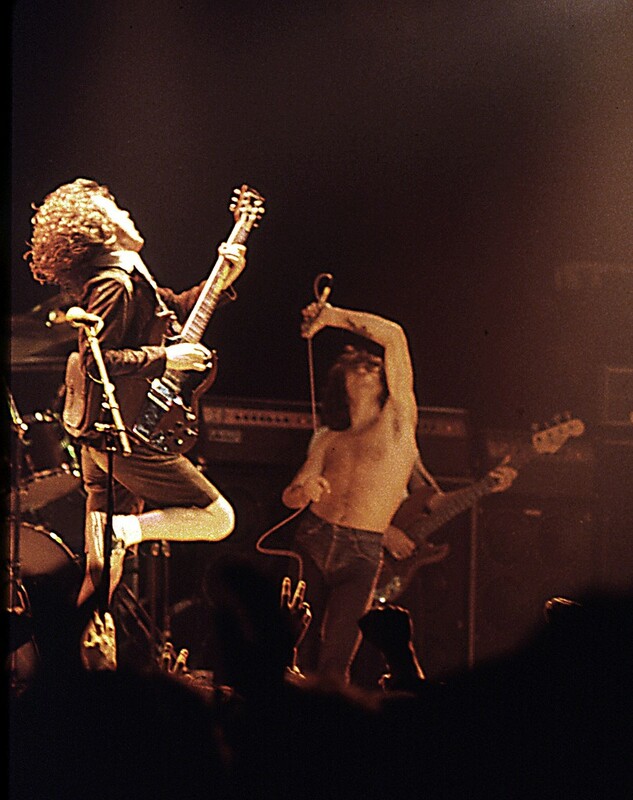 ^ "Snooker on the ropes – Hurricane". BBC. 16 April 2007. Archived from the original on 21 August 2007. https://web.archive.org/web/20070821230132/http://news.bbc.co.uk/sport1/hi/other_sports/snooker/4913768.stm. Retrieved 17 September 2007. ^ "WBA History". World Boxing Association. Archived from the original on 11 October 2007. https://web.archive.org/web/20071011113939/http://www.wbaonline.com/dates/dates03.asp. Retrieved 17 September 2007. ^ "About The Russell Group: Aims and objectives". The Russell Group. 2007. Archived from the original on 7 June 2007. http://www.russellgroup.ac.uk/about.html. Retrieved 24 May 2007. ^ "About Queen's: Facts and Figures". Queen's University Belfast. 2007. Archived from the original on 13 May 2007. http://www.qub.ac.uk/home/TheUniversity/AboutQueens/UniversityInformation/FactsandFigures/. Retrieved 24 May 2007. ^ "Conflict and Politics in Northern Ireland (1968 to the Present)". Conflict Archive on the Internet (CAIN). 2007. Archived from the original on 30 May 2007. http://cain.ulst.ac.uk/. Retrieved 24 May 2007. ^ "Belfast Metropolitan College – About Us". Belfast Metropolitan College. 2007. Archived from the original on 16 December 2007. http://www.belfastmet.ac.uk/aboutus/. Retrieved 12 December 2007. ^ "About Us: The Roles and Functions of the Belfast Education and Library Board". Belfast Education and Library Board. http://www.belb.org.uk/about_us.asp. Retrieved 18 May 2014. ^ "Schools Database – List of Institutions". Department of Education. http://www.denidata.nics.gov.uk/appinstitutes/instmain.aspx. Retrieved 24 May 2007. ^ "Belfast fifth most popular UK tourist destination". Belfast Newsletter. 22 May 2013. http://www.newsletter.co.uk/news/belfast-fifth-most-popular-uk-tourist-destination-1-5114241. Retrieved 19 May 2014. ^ "Titanic Belfast becomes second most visited tourist attraction on island of Ireland" (in en-US). The Irish Times. http://www.irishtimes.com/news/titanic-belfast-becomes-second-most-visited-tourist-attraction-on-island-of-ireland-1.1370127. ^ "Tourism facts and figures - Belfast City Council". http://www.belfastcity.gov.uk/tourism-venues/tourism/tourismfacts.aspx. ^ "Belfast Makes the Top 12". The Daily Telegraph. http://www.telegraph.co.uk/travel/travelnews/3883369/Belfast-one-of-worlds-top-destinations.html. ^ Dougan, Patrice (2 April 2012). "Inside Titanic Belfast – a guided tour". The Belfast Telegraph. http://www.belfasttelegraph.co.uk/archive/titanic/inside-titanic-belfast-a-guided-tour-28733118.html. Retrieved 19 May 2014. ^ "Telegraph article; Announcement of redevelopment of Titanic Quarter". The Belfast Telegraph. 27 November 2008. http://www.belfasttelegraph.co.uk/news/250m-titanic-tourist-attraction-and-transport-system-set-for-belfast-28512145.html. Retrieved 30 May 2009. ^ "Tourist information centre". Tourism. Belfast City Council. 2014. http://www.belfastcity.gov.uk/tourism-venues/tourism/touristcentre.aspx. Retrieved 19 May 2014. ^ "Belfast signs Sister Cities accord with Boston". News. Belfast City Council. 12 May 2014. http://www.belfastcity.gov.uk/News/News-37859.aspx. Retrieved 15 January 2016. This page uses content from the English language Wikipedia. The original content was at Belfast. The list of authors can be seen in the page history. As with this Familypedia wiki, the content of Wikipedia is available under the Creative Commons License.